In Matthew 21:32, Jesus plainly taught that repentance is synonymous with believing the Gospel of the Lord Jesus Christ. Who was it that believed? The publicans and harlots! It was the self-righteous crowd who refused to repent and get saved. The Bible doesn’t tell us that the publicans and harlots gave up their sinful lifestyle. No, rather, the Bible simply states that they repented and believed on Jesus, i.e., they acknowledged their guilt of sin and wanted Jesus to save them. Eternal life is a free gift—freely paid for by Christ's blood (1st Peter 1:18-19), freely offered to whosoever shall call upon the name of the Lord (Romans 10:13), and freely received as the water of life (Revelation 22:17). Jesus paid it all!!! There is a large group of heretics in America today (most of them originating from California), who require lost sinners to try hard to stop sinning to be saved. Do you know why California has been nicknamed the “Granola state”? It’s because it’s a place filled with fruits and nuts. For some reason California leads the way in false prophets. The heresy of Lordship Salvation is epidemic in California. Lordship Salvation is the false doctrine that says faith in the Gospel of the Lord Jesus Christ is insufficient to save. Instead, Lordship Salvationists teach that a person MUST surrender to serve Christ, make a commitment to Jesus, stop sinful bad habits, forsake the world and have intentions to clean up their life of sin. The first birth is a physical birth (of water); but the second birth is a spiritual birth (of God). John 1:12-13, “But as many as received him, to them gave he power to become the sons of God, even to them that believe on his name: Which were born, not of blood, nor of the will of the flesh, nor of the will of man, but of God.” Eternal life is the free gift of God. Of course, nothing in life is free. Jesus paid the ultimate price, Who looking for the joy that was set before Him, endured the cross and was crucified to death for OUR SINS. Hebrews 12:2, “Looking unto Jesus the author and finisher of our faith; who for the joy that was set before him endured the cross, despising the shame, and is set down at the right hand of the throne of God.” Whew, glory to God!!! Everybody, even the best of Christians, sin every day. The Apostle Paul describes his struggle with sinful lusts, which all Christians endure (Romans 7:14-25). Ray Comfort has a WRONG understanding of what it means to repent unto salvation. Lordship Salvation is based 100% upon a misdefining the word repent. Biblical, repentance is a change of mind, not a change of life. 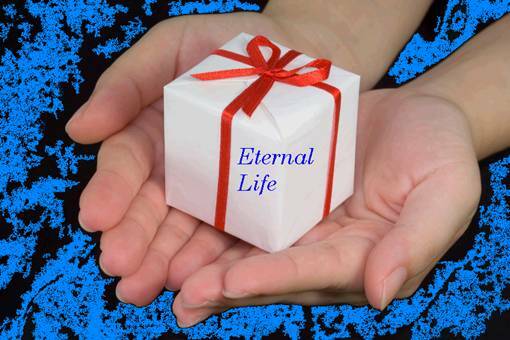 The very fact that the Bible repeatedly teaches eternal life is a gift proves that Lordship Salvation is unbiblical. A gift means a gift, with no strings attached. If I offer you a gift, but condition it on you shoveling the snow in front of my home, then it's not a gift. You're earning it, so it's a reward. It's like the bank that offers you a gift (a toaster) if you open a new account. If I want the toaster, then you have to open a new account. The bank is falsely advertising. The toaster is NOT a gift. It's a reward. My friend, salvation is not a reward. We all deserve to drop into Hell's fire immediately, without delay, to be tormented forever. Forgiveness is God's gift. That's really what salvation is all about, that is, God's gift of forgiveness to us sinners. It's an insult to God to teach that faith in the death, burial and resurrection of Christ is not enough to save a sinner. If you know you're a guilty sinner for breaking God's laws and receive the Gospel as payment for your sins, then you are saved forever!!! Salvation is NOT a process; but rather, a new birth. Beware of any false prophet that teaches salvation as a lifetime process. That's the garbage that Seventh-day Adventists teach. Although it is true that a carnal believer cannot please God, there is no where in the Scriptures where God says he won’t save a person who holds onto personal sins. Who can cease from all their sins? The entire notion of requiring a sinner to clean up their ways as a requirement and prerequisite to be saved is wicked. God does the saving, not man. We are saved by HIS RIGHTEOUSNESS, that is, Christ's imputed righteousness (and not our own self-righteousness [for we have none to offer God]). Ray Comfort is wrong on salvation, which makes him wrong on everything else too. Get mad at me if you want, the Bible is on my side. Salvation is the free gift of God… WITHOUT WORKS! Romans 4:5 and 6 couldn’t be any plainer: “But to him that worketh not, but believeth on him that justifieth the ungodly, his faith is counted for righteousness. Even as David also describeth the blessedness of the man, unto whom God imputeth righteousness without works.” I love that word… imputeth! That means God literally takes Jesus Christ’s righteousness and places it upon our sinful record, declaring us justified… JUST-IF-I’D never sinned at all. What a wonderful Savior! Why doesn't Ray Comfort and John MacArthur quote that? What Spurgeon did teach was that a sinner must “renounce” (i.e., reject one's sins) to be saved. To “renounce” does not mean to literally forsake, otherwise Spurgeon would have used a different word. It is clear from Spurgeon's own statement that he didn't believe in Lordship Salvation at all. Ray Comfort and John MacArthur are barking up an empty tree. Spurgeon simply believed that a person who attempts to justify any sins in their life cannot be saved, until they RENOUNCE all sins as being a violation of God's Holy Law... “Now we know that what things soever the law saith, it saith to them who are under the law: that every mouth may be stopped, and all the world may become guilty before God” (Romans 3:19). Jesus said in John 3:20... “For every one that doeth evil hateth the light, neither cometh to the light, lest his deeds should be reproved.” It is not that we cannot be saved by holding onto our sins; but that our love for sin will prevent us from coming to the Savior to be saved. Lordship Salvation is of the Devil and I’m going to fight it for the rest of my life. Salvation is receiving; not giving. You don’t have to give up anything to be saved. A gift is given unconditionally and freely received (Revelation 22:17). I recently heard John MacArthur on the radio (his sermon tape, The Call To Repentance), in which he said that a person must exchange the world for salvation. This is unbiblical. If a person must give up the world to be saved, then how can salvation be a “free gift” (Romans 5:15; 6:23; Ephesians 2:8,9)? The errant theology being taught today by unscholarly men is akin to a bank offering you a “free gift” if you open a new account with them. Is it really a gift since you have to open a new account to obtain it? No Sir, not at all; It’s false advertising. A genuine “gift” means you don’t have to do anything other than freely receive it. Well, there’s a lot of false advertising in the religious world today concerning salvation. Salvation is not a reward; but rather, a free gift. If you have to open a new bank account to obtain a so-called “gift,” then it’s not truly a gift; but rather, a reward that you earned by opening a new account. Anyone who tells you that salvation is a free gift; but first you have to forsake your sins to get it, is a liar! Salvation is not a reward; It’s a free gift paid for by Jesus’ literal, physical, precious blood (1st Peter 1:18,19; Hebrews 9:12).